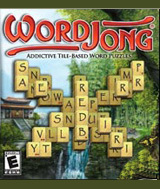 Enter the lush world of WordJong®, a colorful mix of Mahjong and spelling game. WordJong gives you letter tiles you remove from the board Mahjong-style to spell big words for bonus points. Three unique ways to play - Classic, Versus, or Link mode - will keep you spelling for hours. Each set of tiles is a new game to play, with dozens of tile layouts to enjoy. In Classic Mode, you need to build words to clear the board. Use Jade and Wild tiles wisely to uncover your fortune. In Link Mode the last letter of your word becomes the first of the next word. You can also challenge a friend, or a clever cast of in-game WordJong Masters in Versus Mode. Comments: Sooo addicted to this game. Play for hours. Great way to build vocabulary for sure. The majong element forces strategy too and makes for an interesting play.